This homemade dinosaur birthday cake was made for my son’s 3rd birthday. I used a moist chocolate cake recipe x 2 to fill 1 round cake tin and 1 Wilton ball tin (both sides). I cut the round cake in half and stood it on end to create the dinosaurs back; I then sculped the face out of 1 half of the ball tin, and the tail out of the other half. The dinosaur thighs were made from the remainder of the 2nd ball. I then trimmed the half round cakes to fit smoothly with the face, thighs and tail. I crumb coated the whole cake with butter icing, and then I coloured white fondant icing green to cover the body and make the feet. 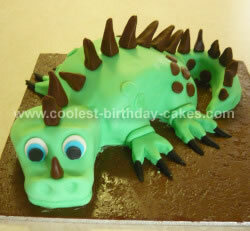 I used chocolate fondant for the spikes on his back and the spots (which were glued on with edible glue). White and blue fondant was used to make his eyes and a black licorice stick to make his pupils. The base of the board is covered in Chocolate Fondant.